The rising demand from the healthcare sector has emerged as one of the chief drivers of the global biochemical sensor market. This, coupled with the growing awareness among people about wearable technology, has helped the market record robust growth in the last few years. With investments in the healthcare sector forecast to scale higher, the biochemical sensor market is likely to gain from the larger adoption of technologically advanced medical devices. In addition, government initiatives aimed towards ascertaining food safety will boost application of biochemical sensors in the agricultural sector, thus helping the market gain considerable momentum. Biochemical sensors are mostly used in clinical trials and in the diagnosis of chronic ailments. Besides this, government initiatives encourage their use in agriculture. Considering this, the rising population will fuel the demand for food products thus giving impetus to the biochemical sensor market. Furthermore, the rising aging population and the increasing incidence of chronic ailments will boost the demand for precise diagnosis, thereby giving impetus to the global biochemical sensor market. The global biochemical sensor market is forecast to reach US$58.48 bn by the end of 2025. It stiid at US$17.1 bn in 2016. If these figures hold true, the global biochemical sensor market will exhibit a CAGR of 14.7% between 2016 and 2025. On the basis of product, the market for biochemical sensor is segmented into electrochemical sensors, optical sensors, gas sensors, thermal sensors, piezoelectric sensors. Based on film deposition material the market for biochemical sensor is segmented into titanium oxide, fluorine doped tin oxide, silicon oxide, aluminum oxide and others. By application the market is classified into clinical diagnosis, environmental monitoring, food quality control, military and others. Regionally North America, Europe, Asia Pacific, Middle East and Africa (MEA) and Latin America make the key market segments. 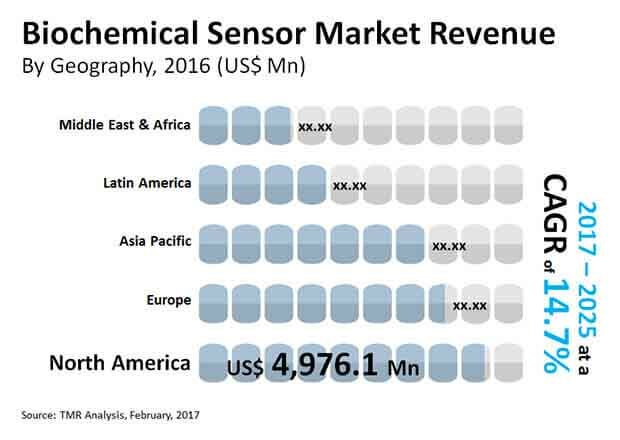 Regionally, North America has emerged as the leading market for biochemical sensors in the world. It held over 29% of the global biochemical sensor market in 2016. The region has been at the fore of research and development, besides which its sophisticated healthcare infrastructure has provided much needed impetus to the market. In addition, the region’s substantial investment in the military and defense sectors will fuel the demand for biochemical sensors. As food security is a major concern, the application of biochemical sensors is quite high in North America’s food sector. This is yet another factor boosting the region’s biochemical sensors market. However, during the course of the forecast period, the market is expected to witness more lucrative opportunities in Asia Pacific and Europe. Asia Pacific will exhibit the leading CAGR during the forecast period on account of rising investment in the healthcare and agricultural sectors. Based on product, the electrochemical sensor segment emerged dominant in the market with a share of 32% in 2016. The dominance of this segment is forecast to remain intact through the forecast period. Its high sensitivity and application in chemical diagnosis are key factors behind the steep growth exhibited by the segment. Besides this, the market is expected to witnessing rising demand for optical sensors in the forecast period. While the demand for gas sensors is forecast to increase on account of their increasing application in oil exploration activities. Some of the leading companies operating in the global biochemical sensor market are GE Healthcare (U.S.), Thermo Fisher Scientific. (U.S.), Honeywell International Inc. (U.S.),Bio-Rad Laboratories Inc. (U.S.), Polestar Technologies Inc. (U.S.), Microchip Technology Inc. (U.S.), Melexis (Belgium), Universal Biosensor Inc. (Australia), Nova Biomedical Corporation (U.S.), and Texas Instrument Inc. (U.S.). This report covers the analysis and forecast of the biochemical sensor market on a global and regional level. The study provides historic data of 2016 along with forecast for the period between 2017 and 2025 based on volume (Mn Units) and revenue (USD Mn). The study provides a decisive view of the biochemical sensor market by segmenting it based on product type, film deposition material, application, and regional demand. Application segments have been analyzed based on current trends and future potential. The market has been estimated from 2017 to 2025 in terms of volume (Mn Units) and revenue (USD Mn). Regional segmentation includes the current and forecast demand for North America, Europe, Asia Pacific, Latin America, and the Middle East and Africa. These have been further sub-segmented into countries and regions with relevance to the market. The segmentation also includes demand for individual applications in all regions. The study covers the drivers and restraints governing the dynamics of the market along with their impact on demand during the forecast period. Additionally, the report includes potential opportunities in the biochemical sensor market on the global and regional level. It encompasses market attractiveness analysis, wherein applications have been benchmarked based on their market size, growth rate, and general attractiveness for future growth. The market has been forecast based on constant currency rates. Prices of biochemical sensor vary in each region and are a result of the demand-supply scenario in the region. Hence, a similar volume-to revenue ratio does not follow for each individual region. Individual pricing of biochemical sensor for each application has been taken into account while estimating and forecasting market revenue on a global basis. Regional average price has been considered while breaking down the market into segments in each region. The report provides the size of the biochemical sensor market in 2016 and the forecast for the next nine years up to 2025. The size of the global biochemical sensor market is provided in terms of both volume and revenue. Market volume is defined in million units, while market revenue for regions is in USD Mn. The market size and forecast for each product segment is provided in the context of global and regional markets. Numbers provided in this report are derived based on demand generated from different applications. Market estimates for this study have been based on volume, with revenue being derived through regional pricing trends. The price for commonly utilized grades of biochemical sensor in each application has been considered, and customized product pricing has not been included. Demand for biochemical sensor has been derived by analyzing the global and regional demand for biochemical sensor in each application. The global biochemical sensor market has been analyzed based on expected demand. Market data for each segment is based on volume and corresponding revenues. Prices considered for calculation of revenue are average regional prices obtained through primary quotes from numerous regional suppliers, distributors, and direct selling regional producers based on manufacturers’ feedback. Forecasts have been based on the expected demand from biochemical sensors. We have used the top-down approach to estimate the global biochemical sensor market, split into regions. The product type split of the market has been derived using a top-down approach for each regional market separately, with the global product type segment split being an integration of regional estimates. Companies were considered for the market share analysis based on their product portfolio, revenue, and manufacturing capacity. In the absence of specific data related to the sales of biochemical sensor of several privately held companies, calculated assumptions have been made in view of the company’s product portfolio and regional presence along with the demand for products in its portfolio. The report covers a detailed competitive outlook that includes market share and company profiles of key players operating in the global market. Key players profiled in the report include GE Healthcare (U.S.), Thermo Fisher Scientific. (U.S.), Honeywell International Inc. (U.S.), Bio-Rad Laboratories Inc. (U.S.), Polestar Technologies Inc. (U.S.), Microchip Technology Inc. (U.S.), Melexis (Belgium), Universal Biosensor Inc. (Australia), Nova Biomedical Corporation (U.S.), and Texas Instrument Inc. (U.S.).